There’s been speculation on the next federal election date being as soon as 9 months’ time, and with what’s happening with the leadership challenge that’s taking the central stage lately, all political parties are probably getting all hands on deck now with their next election campaign. Politicians often say every vote counts, but some voters have a more fluid political standpoint and are less attached to any party but more to the issues; these are the votes that could make and break the election. A survey conducted by Triple J over ten thousand 18-29 years old suggested that 69% of this demographic are swinging voters. In fact over half of them still hadn’t decided who to vote for two months prior to the 2016 federal election. According to the Australian Electoral Commission, young voters represent about 30% of the electorate. A study from the Whitlam Institute revealed that voters under the age of 35 have had a substantial effect on past elections, yet they are an electoral cohort that is not very well understood, with their voting intention being consistently different from those of the other age groups. It is more vital than ever then, for politicians to get to know these young voters and to understand what issues they truly care about in order to speak to their needs and win over their votes. That’s why polling is essential for any campaign who wants to galvanise young voters. Now polling is important, but who does the polling is also very important. With the Cambridge Analytica incidents, political parties should be selective with whom they partner to avoid the same kind of scandal. While for more complicated issues, outsourcing might be required for some deeper and richer analysis, modern technologies have made polling less labour intensive and easier to manage in-house, and it is a matter of finding the right tool. To date, most pollings are done via telephone interview, robo-polling (pre-recorded voice calls to mobile and landline), face to face interview and online surveys; political parties may have overlooked one powerful and significant polling tool – SMS Surveys. SMS enjoys 94% open rate; in fact, our survey reported that the open rate of SMS for Australians aged from 18 to 44 actually reaches 100%. That means you can be assured that your messages will get read. Indeed, politicians have started using SMS to broadcast their messages to the public, probably for this very same reason. But with the simple addition of a virtual mobile number, they can open the door to two way communications. Yes SMS is well received, but what about the response rate? One of the six major national public polls, Roy Morgan, use SMS surveys for their fortnightly polling, and reported a 50% response rate from their SMS interviews. Response rates for an email survey average 24.8% (Fluidsurveys), with telephone surveys averaging 9% (Pew Research); SMS surveys clearly outperform these more traditional methods. 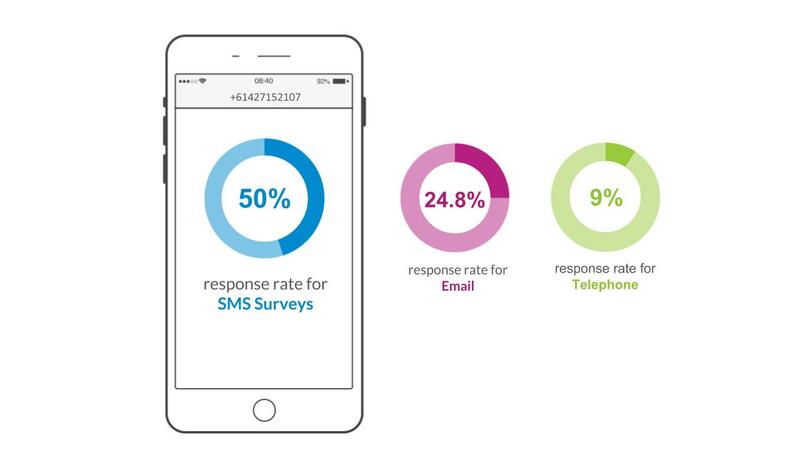 The reason for such high response rates is due to the fact that SMS surveys are direct yet non-intrusive. They are delivered straight to the handset of the recipient, yet do not demand immediate attention like a phone call, allowing the receiving party to respond to it at a time that suits them best. SMS surveys can be either linear or branched, with the flexibility to ask follow up questions based on earlier responses, thus providing an opportunity for the inquirer to look for further insights. All survey data is processed in real time and will get fed back instantly to the dashboard, keeping the sender well informed so any change of tactics or strategy could be implemented quickly, which is often crucial to the success of an election campaign. If you would like to know more about SMS surveys, or are interested in using it for polling, please get in touch at 1300 764 946.